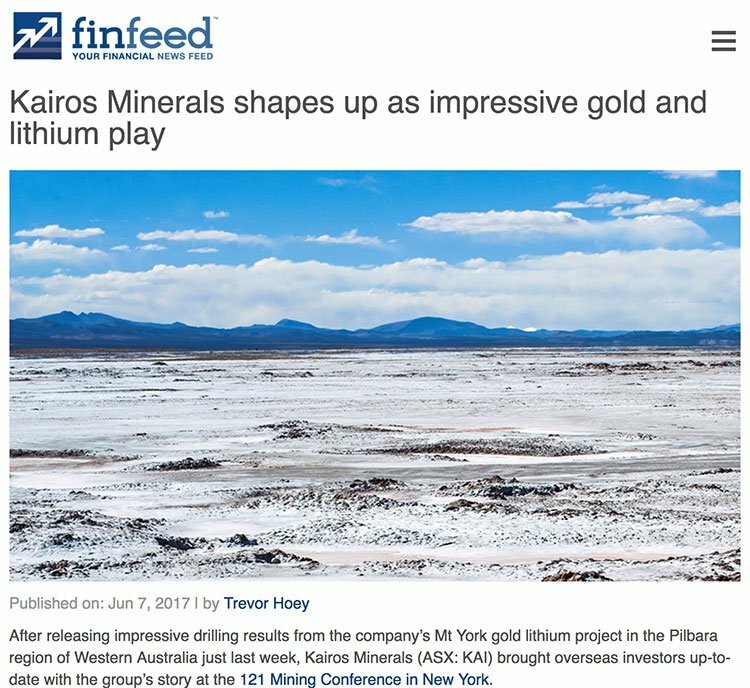 The good news continues to flow from Kairos Minerals (ASX:KAI), specifically that coming out of its highly prospective Roe Hills Project in Western Australia. Since we last updated you on KAI back on March 2, KAI completed its aircore (AC) drilling programme to test for cobalt and gold at the project. Assay results are now in, and they’re certainly impressive... high-grade, shallow cobalt mineralisation, of up to 1.36% cobalt was intersected. The cobalt (and manganese) grades intersected are exceptionally high when compared to not just other projects in Australia, but to other nickel-cobalt oxide deposits globally. The project already had plenty of reasons for us to keep an eye on its success. For one, it sits in the middle of a rapidly emerging gold region in Western Australia and is located next door to and over the same geology along strike to the south of Breaker Resources’ (ASX: BRB) gold discoveries at its Lake Roe Project. Add to that, the fact that KAI has also completed reverse circulation (RC) drilling for gold at Roe Hills. Assays are due in just weeks for the 2,800m gold-focused drilling programme — comprising 34 Aircore/RC holes designed to test a number of high-priority gold targets including Terra, Lady of the Lake and Ginger Kiss. This drilling programme comes after confirmation of an extensive new shallow gold zone at Roe Hills. 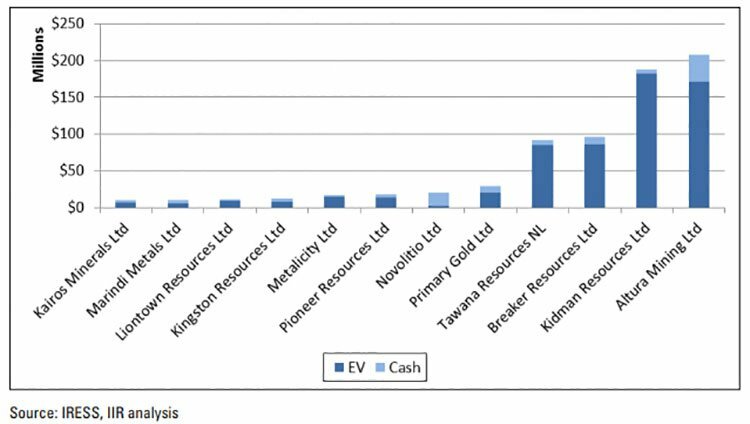 Plenty of newsflow has also come out of KAI’s other projects that span gold, lithium, cobalt and nickel. 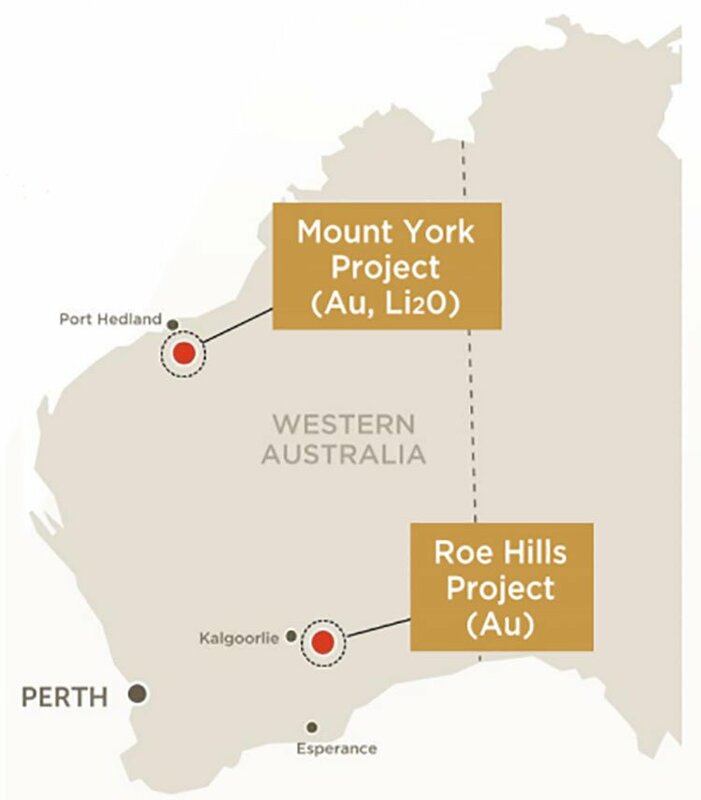 In addition to Roe Hills, KAI is also concentrating its exploration activities at its highly prospective tenement packages at its 100%-owned Mt York Lithium-Gold Project in WA’s Pilbara region. It should be noted here, however, that KAI is still an early stage exploration play and investors should seek professional financial advice if considering this stock for their portfolio. 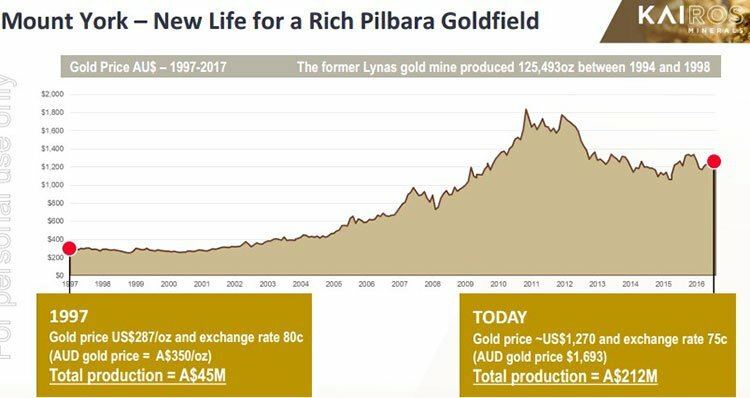 The Mt York Gold-Lithium Project is located immediately to the east and the south of Pilbara Minerals’ (ASX: PLS) and Altura Mining’s respective Pilgangoora lithium resources, and is located over the historic Lynas Find Gold Project. 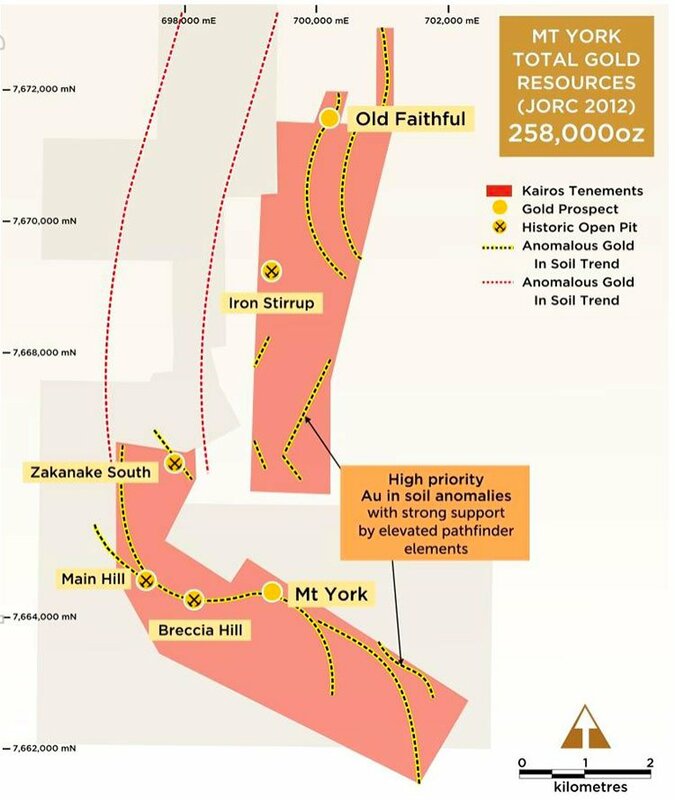 KAI received all final assay results its maiden gold-focused drilling programme at Mt York earlier this year . The project already had an Indicated and Inferred JORC 2012 compliant gold resource totalling 5.692Mt @ 1.42 g/t gold for 258,000 ounces of contained gold. Drilling programmes at each of the projects have returned very encouraging results to date, highlighting the prospectively of the region and KAI’s project itself. 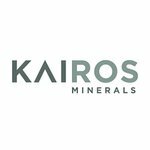 Kairos Minerals (ASX: KAI) is attacking the opportunities in Western Australia with a two-pronged focus on its Roe Hills and Mt York Projects. KAI’s Roe Hills Project, in WA’s Eastern Goldfields region, 120 kilometres east of Kalgoorlie, houses a prospective strike length of more than 40 kilometres of southern extensions of Leonora-Laverton greenstone belts (~30Moz endowment), which has been largely untested. The maiden drilling program at the Roe Hills project returned significant gold mineralisation at each of the three key prospects that were tested. And now, ... KAI has added exceptional high-grade cobalt mineralisation at Roe Hills. KAI’s second focus in WA is its Mount York Project is located in the Pilbara region, approximately 120 kilometres south of Port Hedland. The project contains a 250,000 oz resource, and between 1994 and 1998 it produced 125,493 oz. KAI’s maiden gold drilling programme at Mt York has highlighted significant near-term resource expansion opportunities. The map below indicates exactly where the projects are located. While it’s all go for KAI at both Mount York and Roe Hills, it is Roe Hills that has just served up the most significant of recent developments. 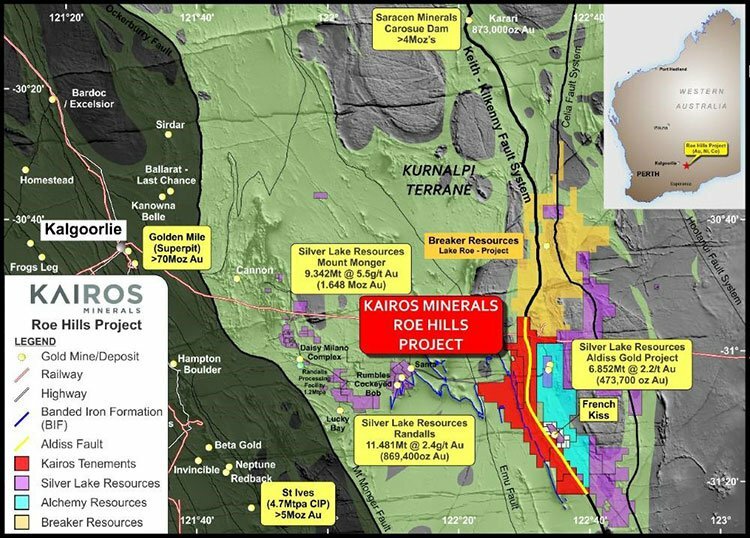 KAI’s Roe Hills Gold Project is a 324 square kilometre land-holding with a strike length of approximately 40 kilometres where significant intercepts of cobalt mineralisation have been identified. The project is situated within the Southern Kurnalpi Terrane of the Eastern Goldfields of Western Australia. 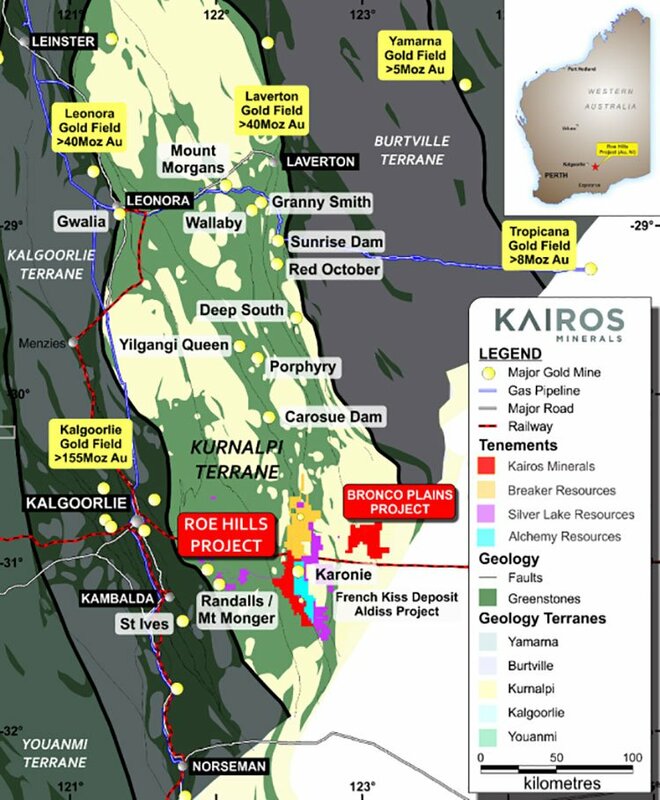 This is a rapidly emerging and highly prospective gold province, which is currently enjoying a significant level of exploration activity and investor interest — as demonstrated by the recent success of Breaker Resources (ASX: BRB) Lake Roe gold discovery, located approximately ten kilometres north of the KAI’s project. Silver Lake Resources (ASX: SLR) also has projects in the area. On July 12, KAI reported assay results from its maiden drilling programme at Roe Hills, confirming extensive, shallow high-grade cobalt-nickel-manganese oxide mineralisation up to 1.36% Cobalt. Significant zone of near-surface cobalt-nickel-manganese mineralisation was intersected over a continuous strike of at least 700 metres in length and up to 150 metres in width at the ROE-1 prospect in the recently completed 59-hole, 1,851m cobalt-focused Aircore drilling program. 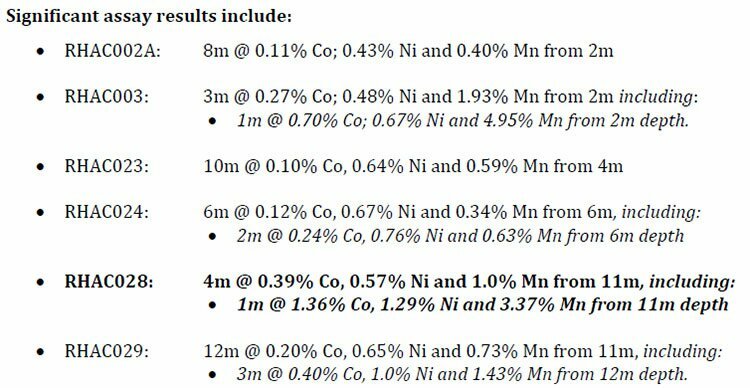 Numerous holes returned significant widths of exceptionally high-grade cobalt-nickel-manganese (Co-Ni-Mn) oxide mineralisation from near-surface/shallow depths. The drilling has outlined a continuous zone of high-grade cobalt-nickel-manganese mineralisation averaging 8m in thickness and 0.15% cobalt (applying a 0.05% cut-off) over a minimum strike length of 700m, a width of up to 150m and extending from just 2m below surface to a maximum drill intersection depth of 43m. KAI has planned a follow-up program of approximately 2,000 metres of Aircore drilling for later this year to test extensions of the ROE-1 cobalt prospect along with several other high-priority cobalt prospects identified throughout the Roe Hills Project. The image below, on the left, highlights the ROE-1 cobalt drill holes. The image on the right identifies the high-grade cobalt mineralised zone. Prior to this, on June 22, KAI announced that it had completed its AC drilling programme at Roe Hills , testing for cobalt and gold anomalies. 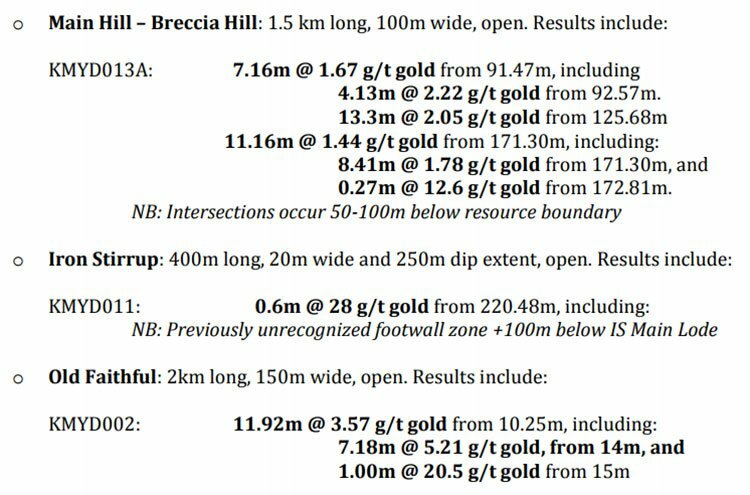 The programme involved a total of 78 Holes for 2,845m, which included 59 holes for 1,851 metres at Roe 1 cobalt anomaly; 17 holes for 762 metres at regional gold targets West of Roe 1; and two holes for 232 meters at gold target at the Terra Prospect. The initial AC drilling for targeting high-grade cobalt mineralisation covers a total strike length of 7.5 kilometres at the Roe 1 prospect. These high-grade results followed significant intercepts of cobalt mineralisation during historical drilling at Roe 1. ROE172: 14 metres at 0.39% cobalt from 20 metres, including 2 metres at 1.16% cobalt from 22 metres. The second phase of the gold (RC) drilling programme at Roe Hills has now been completed. The second (gold-focused) phase of the most recent drilling campaign has also now been completed. 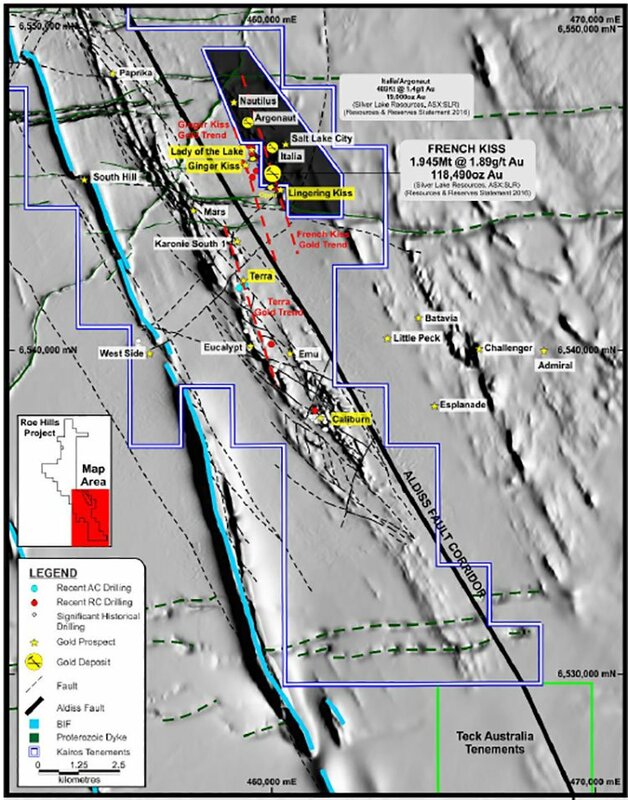 An initial program of 17 holes for 762m of Aircore (AC) drilling was undertaken to evaluate recently identified structural gold targets at two prospects situated west of the ROE-1 area. This comes after the completion of the initial program of AC drilling at the newly identified Northern prospects and at the northern end of the strike extensive Terra prospect. The company is awaiting gold assays, which it expects in coming weeks. 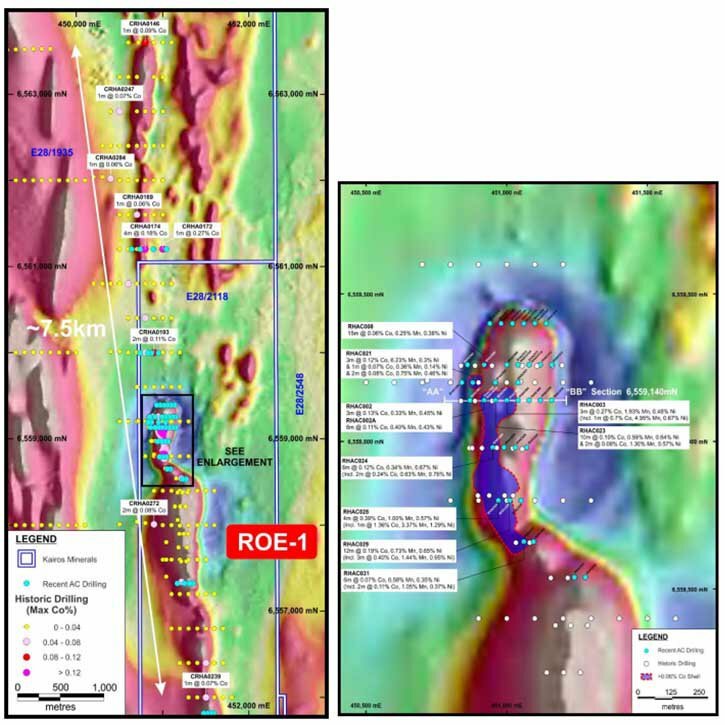 On top of this, drilling indicates the potential for Roe Hills to host significant gold mineralisation along a largely untested prospective strike length of more than 40 kilometres. RC drilling to test the strike and depth continuity of the excellent gold results generated by the maiden drilling programme completed earlier this year has now been completed with assays due in just weeks. Investors will surely be keen to see the see progress of this programme given that the company has suggested that the gold system may be significantly larger than initially thought with wide, high-grade intercepts outside existing resource boundary. KAI’s Mt York Gold-Lithium Project is located approximately 120km south of Port Hedland, in tier-1 mining district, which is underexplored for gold. It sits immediately adjacent to Pilbara Minerals’ world-class Pilgangoora Lithium-Tantalum Project and Altura Mining’s Project, as can be seen below. The project was acquired in early 2016 as part of a new growth strategy focusing on the Australian lithium and gold sector. 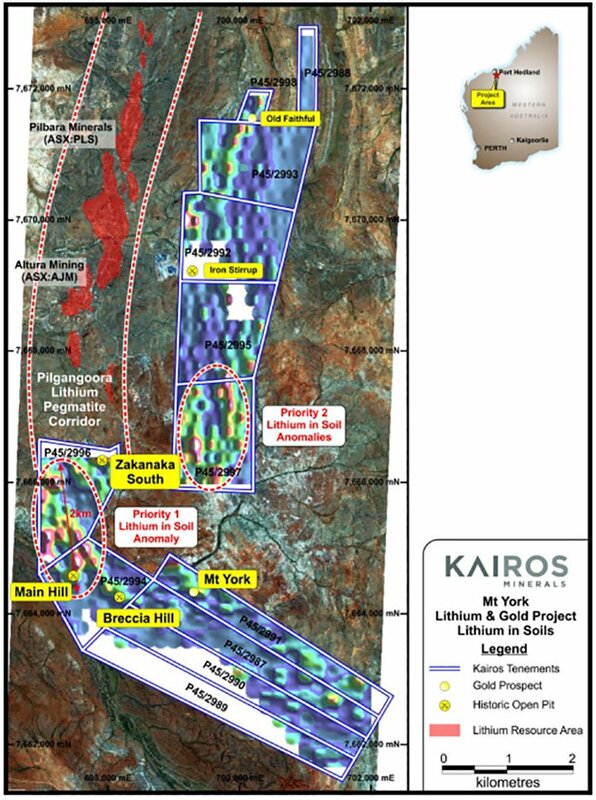 While evaluating the lithium potential of Mt York, Kairos recognised an opportunity to quickly establish a high-quality gold asset at the project. It successfully defined an Indicated and Inferred JORC 2012 compliant gold resource totalling 5.692Mt at 1.42 g/t gold for 258,000 ounces of contained gold — a catalyst for rapid and focused ongoing gold exploration. Although it should be stated that KAI still remains a speculative investment and caution should be applied to any investment decision made with regard to this stock. 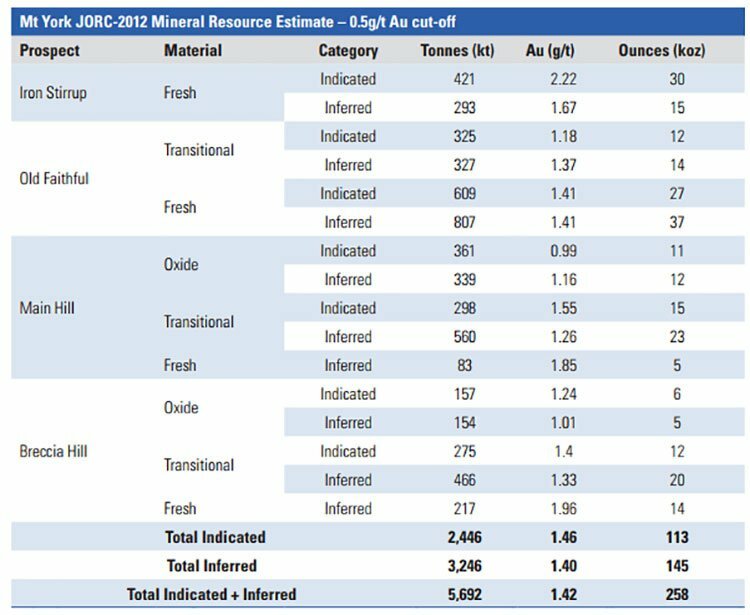 The following table outlines the project’s indicated and inferred JORC resources. 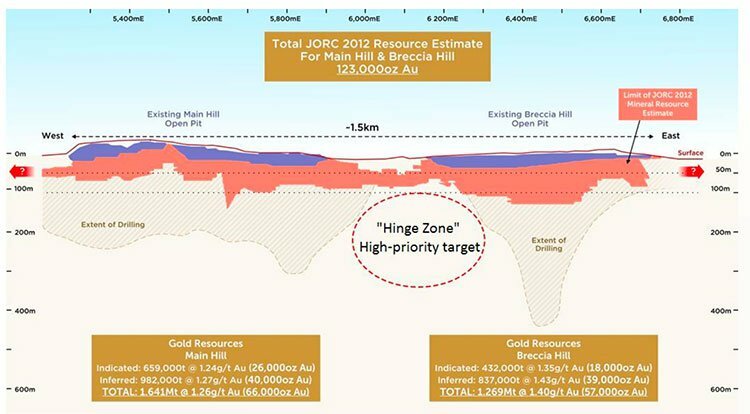 As you can see above, Mt York is a significant gold asset — with a JORC 2012 resource base of a quarter of a million ounces. And now the recent drilling programs have made it clear that there’s potential to significantly expand this gold inventory. KAI is planning the next stage of exploration across its extensive and high quality lithium portfolio at Mt York and the East Pilbara region. You can see KAI’s 100%-owned and JV tenements in the region marked on the map above. In Late May, KAI received the final assay results from its maiden gold drill programme at Mt York that began in September 2016. Kai was also exploring for lithium at Mt. York — as can be seen in the map below. The shallow oxide resources at Main Hill and Breccia Hill were last mined in the mid-1990s in a much lower gold price environment. The project has proven performance when operated as the Lynas gold mine. As you can see below, the conditions are far more favourable today in terms of the economic viability of the project, plus there appears to be potential to produce far more ore than was the case between 1994 and 1998. But that’s only part of the story at Mt York with a much bigger gold story to be unlocked, including the project’s lithium potential. 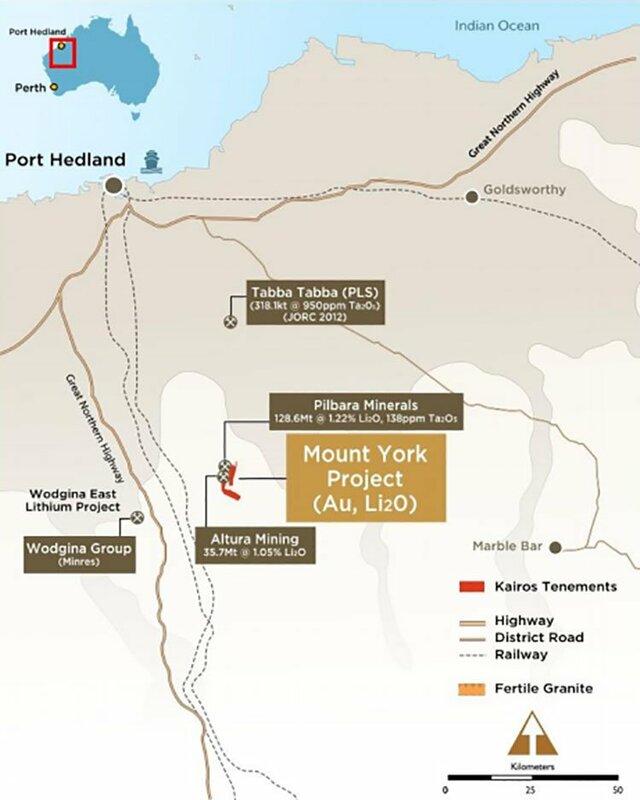 The Mt York project is valued by the company as a strategic and valuable asset – both because of its significant lithium potential, being located on the doorstep of one of the world’s most significant new lithium development projects at Pilgangoora, and because of its outstanding gold potential. All of the outstanding results from the maiden drilling program completed earlier this year have now been received and analysed and now KAI is ready to move on with the next stage of exploration. In Late April, KAI announced that it had secured the Bronco Plains Project, located 30km east of its flagship Roe Hills Project. 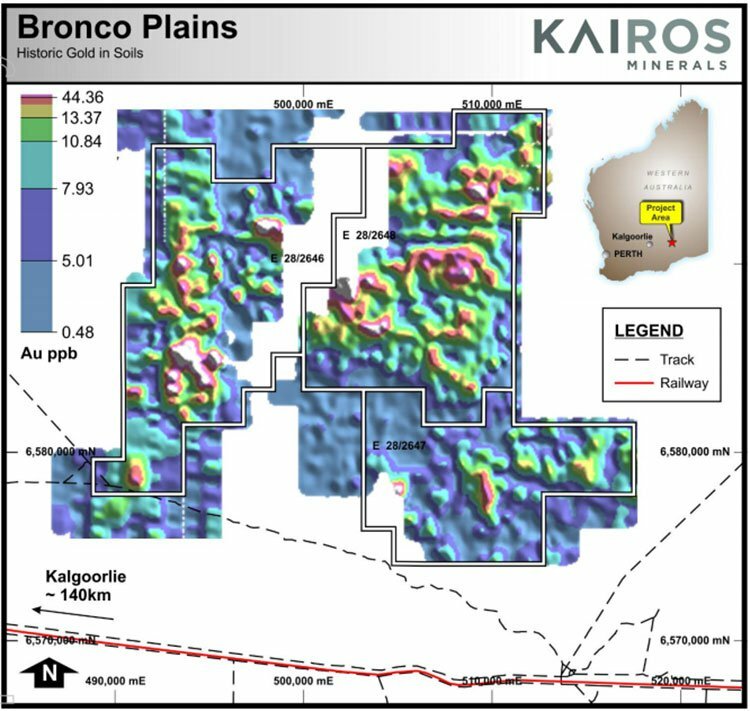 Bronco Plains was identified by Kairos’ technical team as part of the Company’s ongoing regional evaluation. It consists of three Exploration Licenses totalling an area of 389km2. Originally part of AngloGold’s East Tropicana portfolio, Bronco Plains has multiple strong gold-in-soil anomalies within a favourable structural setting located towards the eastern margin of the Southern Kurnalpi Terrane and remains underexplored. 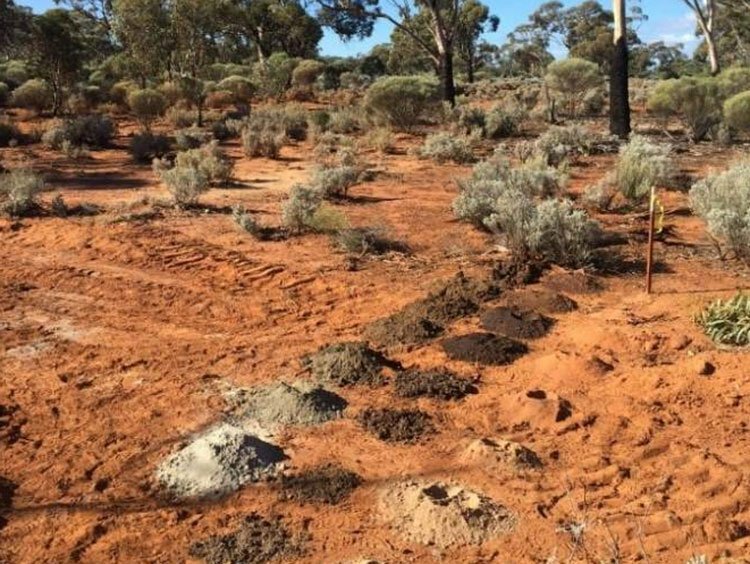 Soil geochemical surveys are underway, the results of which will be used in combination with a full technical review of historical data to refine priority drill targets. KAI has explained that it has an over-arching strategy to continually assess opportunities which will complement its flagship Roe Hills Project. Bronco Plains certainly fits with KAI’s existing high quality exploration portfolio in the highly prospective and under-explored Southern Kurnalpi region. In early June, KAI introduced its story to overseas investors, presenting at the 121 Mining Conference in New York. The article below outlines the highlights from KAI’s presentation. Also of interest to switched on investors is a research report published in June by research house Independent Investment Research on KAI and its portfolio of exploration projects. *EV is generally seen as a more comprehensive way of valuing a company, it includes market cap plus any debt, minus total cash or investments. The analysts have a 12-month price target on the stock ranging from 1.9 cents (just above the current share price of 1.6 cents) up to 7.1 cents per share. That looks to be a lot of upside for investors. This target was assigned based on the recent successful drilling programmes and the company’s broader strengths — its highly prospective tenement portfolio, exposure to both gold and lithium (not even mentioning the cobalt potential), experienced management team, operations in mining friendly jurisdictions, and its projects being close to infrastructure. KAI intend to return with a follow-up drilling program at Roe Hills to further define the cobalt mineralisation, test immediate extensions of the deposit and provide a first-pass test of other priority cobalt prospects in the region. KAI is also awaiting assays for the recently completed gold-focused drilling at the project. While KAI has a number of promising projects underway, it has focused the bulk of its attention on the recent outstanding cobalt and gold results out of Roe Hills, plus the lithium and gold potential at Mt York. The fact that KAI’s portfolio spans the hot commodities of gold, plus cobalt and lithium, there are a number of reasons for investors to pay attention as KAI’s projects progress towards commercialisation.